Wanted poster broadside issued by Gov. Wanton for those reponsible for the burning of the Gaspee. The four known copies are at the RI State Archives (right, and easy to read), the RI Historical Society, the New York Public Library, and at left, a previously unknown copy was sold by Swann Galleries at auction for $27,600 to an unnamed bidder on October 21, 2004.. Click images to enlarge. The reward offer was also published in both the Newport Mercury and the Providence Gazette for several editions beginning Saturday, June 13, 1772. 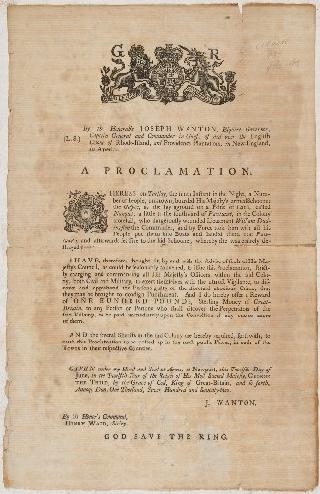 I HAVE therefore thought fit, by and with the Advice of such of His Majesty's Council as could he reasonably convened, to issue this Proclamation, strictly charging and commanding all His Majesty's Officers within the said Colony, both Civil and Military, to exert themselves, with the utmost Vigilance, to discover and apprehend the Persons guilty of the aforesaid atrocious Crime, that they may be brought to condign Punishment. And I do hereby offer a Reward of ONE HUNDRED POUNDS Sterling, Money of Great Britain, to any Person or Persons who shall discover the Perpetrators of the said Villains, to be paid of them. AND the several Sheriffs in the said Colony are hereby required forthwith to cause this Proclamation to be posted up in the most public Places in each of the Towns in their respective Counties. GIVEN under my Hand and Seal at Arms, at Newport, this Twelfth Day of June, in the Twelfth Year of the Reign of His Most Sacred Majesty GEORGE the Third, by the Grace of God King of Great-Britain, & Anne Domini 1772.